Aer Lingus today unveiled a refreshed brand with updated logo and new aircraft livery, designed to communicate the airline’s positioning as a modern and contemporary Irish brand that competes on the international stage. The new brand refresh — created with brand design firm Lippincott — is part of the airline’s ambitious growth plan that will see Aer Lingus increase its North Atlantic fleet from 17 to 30 aircraft by 2023. The effort supports Aer Lingus’ ambition to be the leading value carrier across the North Atlantic. The new logo remains but restyles the iconic shamrock, adding a tilt to symbolize dynamism and speed, with heart-shaped leaves intended to reflect warmth and hospitality from the brand. 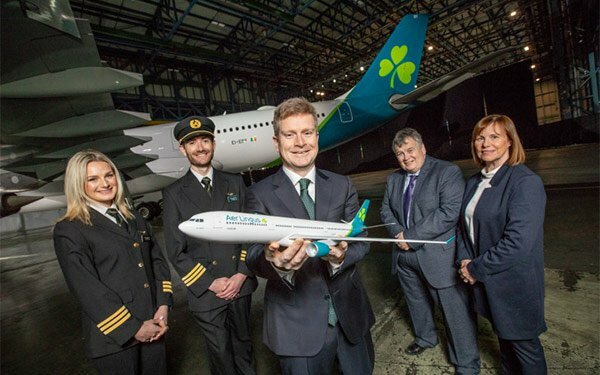 Four shamrocks are featured on the new Aer Lingus aircraft livery: within the new logo, on the tailfin, at the door, and on the wingtip, the last strategically placed for capturing on social media. The body of the new-look aircraft will be white with a teal-colored tail, undercarriage and engines. The refresh is being rolled out today across all brand platforms, with a new website and app design. It will be visible across all guest touchpoints, from check-in to boarding gate and on to the aircraft.